On August 20th, 2016 the Sanford Police department found two males with gunshot wounds while responding to a shots fired call. The investigation of the incident showed probable cause that a suspect by the name of Anquan Collier was responsible for the shooting. An attempted felony homicide warrant was issued for Mr. Collier. 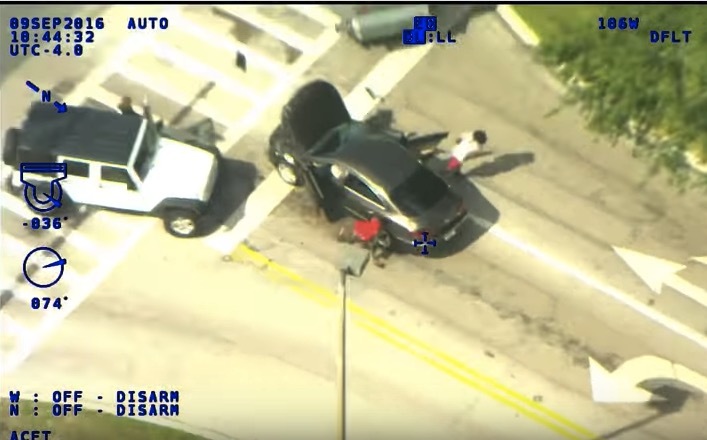 A video shot from a Seminole County Sheriff Department’s helicopter was released yesterday on September 9th, 2016 showing Sanford Police Department officers, along with other law enforcement agencies, apprehending Collier and a few of his buddies. Collier crashed his car into an unmarked Sanford Police vehicle after an attempted stop. After Collier wrecked into the officer’s vehicle, he and passenger Deon Brown attempted to flee the scene on foot. Collier was caught after a brief foot chase. Brown jumped into someone’s car and told them to drive. Sanford Police stated that a firearm was recovered from the scene. The third occupant, Richard Scott, did the smart thing and stayed put in the vehicle. He was charged with possession of marijuana. Anquan Collier was arrested for several charges including attempted homicide, delinquent in possession of a firearm, possession of a firearm during a felony, aggravated battery of a LEO with a deadly weapon, fleeing and eluding, resisting an officer without violence, and leaving the scene of a crash. Deon Brown was arrested for resisting an officer without violence and carrying a concealed firearm.